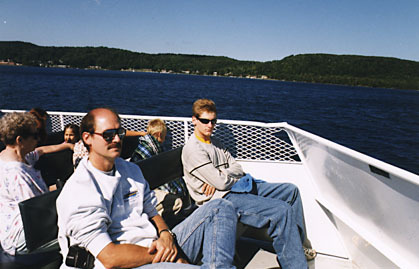 The purpose of our trip was to take our son to college at Michigan Tech and then vacation for a week in the U.P. 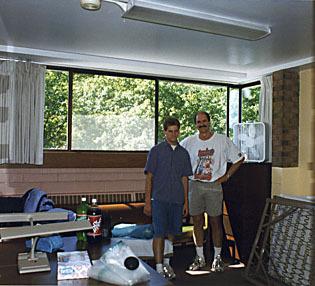 Our first day was actually Friday, August 28th, leaving home by 3:30. Our route on this trip went from 94W - 127N - 75N - 2W. We stopped in the Matrix Point rest area after about 6.5 hours of driving. The signs say no overnight stays, but I always wonder what qualifies as overnight. We stopped for breakfast the next day in Naubinway and continued on our way to Houghton/Hancock via 2W - 77N - 28W - 41N - 203N (a bumpy road). We stopped in Marquette at a Mexican restaurant called the Border Grill, the food was good. We also tried taking the pictured rock tour ship but turned around after 1/2 hour due to rough water. We stayed here August 29th and 30th. McLain has one whole row of campsites on the water. 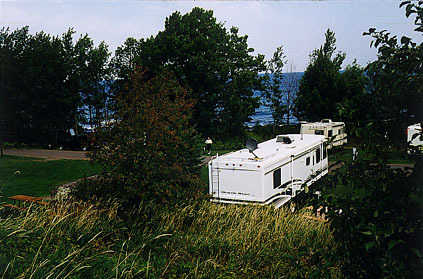 We stayed on site 90, right on Lake Superior. 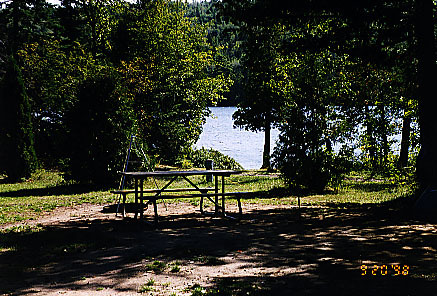 The campground is nice with a few sights having a far amount of separation from your neighbors. 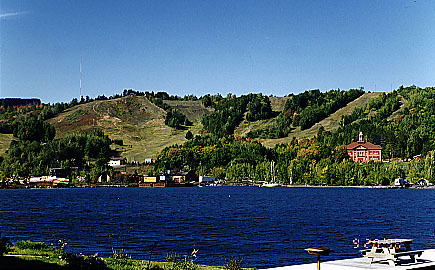 Houghton and Hancock are within 15 minutes, with plenty of stores if needed. Our route here was 203N - 41N - 26E. We went through Eagle River and Eagle Harbor on 26 that had great secluded beaches. We stayed here August 31st. There are two campgrounds: East and West. 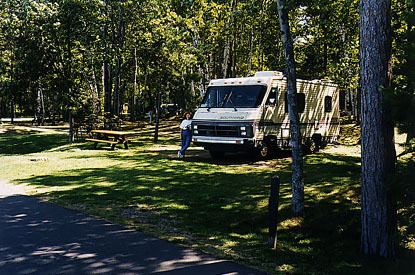 The West campground has more trees and privacy. We were happy with our site 168, it was right on Lake Fanny Hooe. Roger from work recommended site 142. 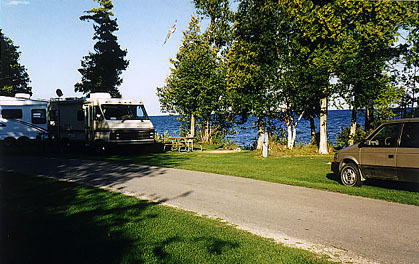 I did see one site (10) at the East campground that was very nice and Roger recommended sites 58-60. We biked to the Fort, then up 41N until it ended and then on to a dirt road for about 6 miles. We turned around before getting to any scenic point. 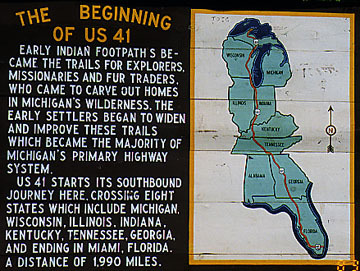 Highway 41 starts about 3 miles north of the campground and goes all the way to Miami, Florida, 1990 miles away. While here we took the sunset lighthouse boat tour from the Copper Harbor Marina ($14 each). It was a relaxing ride with some sightseeing. Brockway Mountain is real close to here and if you go up a very steep road you get great views and a good place to try to see the Aurora Borialis at night. 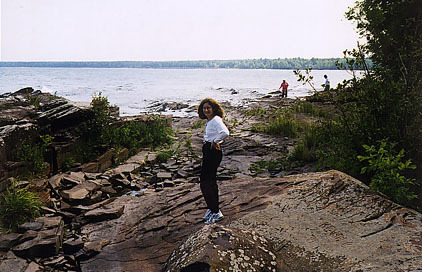 Copper Harbor area was one of my favorite stops, due to the secluded areas with enough close by to explore. We stayed here September 1st and 2nd. Our route here was 41S - 26W - 38W - 64W - 107N. 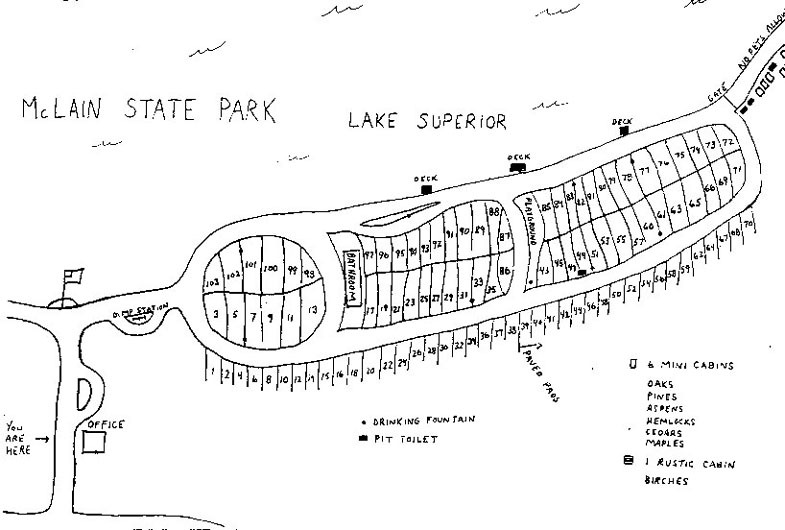 We stayed on site 13, right on Lake Superior again. The sites on the water (11, 13, 18-20, 21, 23, 25, 26, 28, 29) were lower than the sites behind them, so another row had good views of the water. It was a great site with red rocks you could go lay out on and listen to the waves coming in. Lake in the clouds is a good place to go for a view from way up. One night when out for a walk we saw what we thought was a cat, but when we saw a strip on its back, decided to walk the other way. 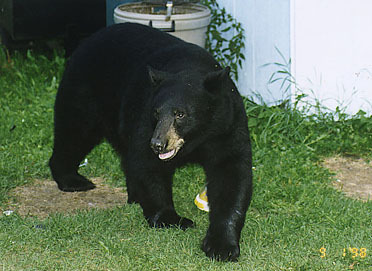 There was a restaurant not far from the campground called "End of the Rainbow" where they let the bears get in their dumpster. 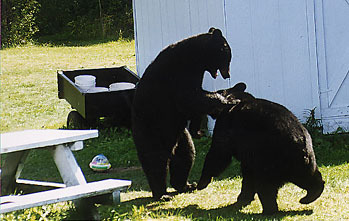 This was the best place to see bears. 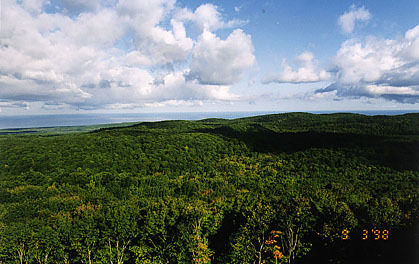 Porcupine Mountains is a hikers dream, unfortunately, I must not be a hiker. We went on a trail called Little Carp River Trail and after about 1 hour and 45 minutes of trails through the woods, we turned around and came back. Our 3.5 hour hike bored me to tears, but Lynn liked it. 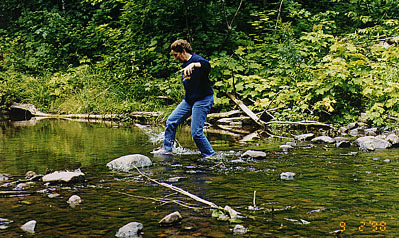 I did have fun watching her try to cross a stream on rocks and finally give up and walk through with soaking shoes, but besides that the most interesting thing was the bear droppings on the trail. By the time we got back we were both tired and I had suggestions like: put mile markers up so you can tell how far until a point of interest. There are a lot of trails, a few we went on in Presque Isle the next day and they had much more points of interest in shorter distances (thankfully). 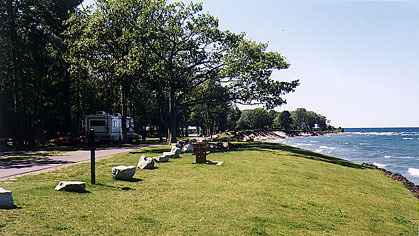 Presque Isle Campground has no electric but sites on the water (1-15 odd, 60-66 even). We stayed here September 3rd. Our route here was 107W - County Road South - 28W - 2E- 41N (through Escanaba) - 35S. It took us about 5 hours to get there. 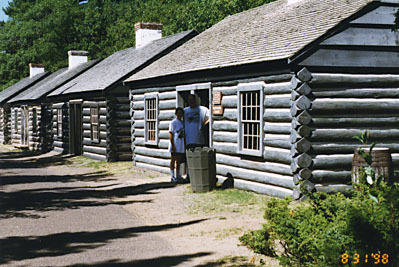 The sites are not as secluded as I like but they had sites on Lake Michigan. We were able to bike along the water into town (Cedar River, 6 miles round trip). We also saw large woodpeckers that looked like Woody Woodpecker from the cartoons. We stayed here September 4th. Our route here was 35N - 2E. It took us about 2 hours to get there. 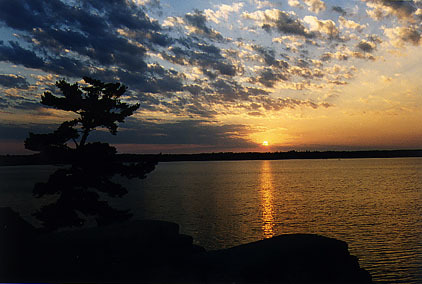 The sites are not as secluded as I like but they had a lot of sites on Indian Lake. We were able to bike into town (Manistique, 14 miles round trip). This was Friday, just before the Labor Day weekend crowd, so we were glad to be coming home. The leaves on the trees were just starting to change colors. 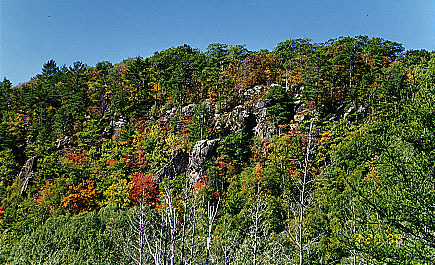 In about 2-3 weeks it will be an ideal time to see the colors. 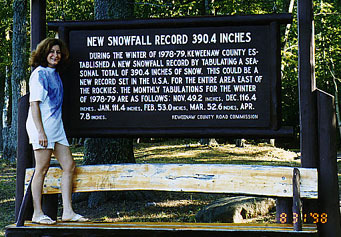 The temperature was great, 50-60 degrees at night, and 65-80 during the days. 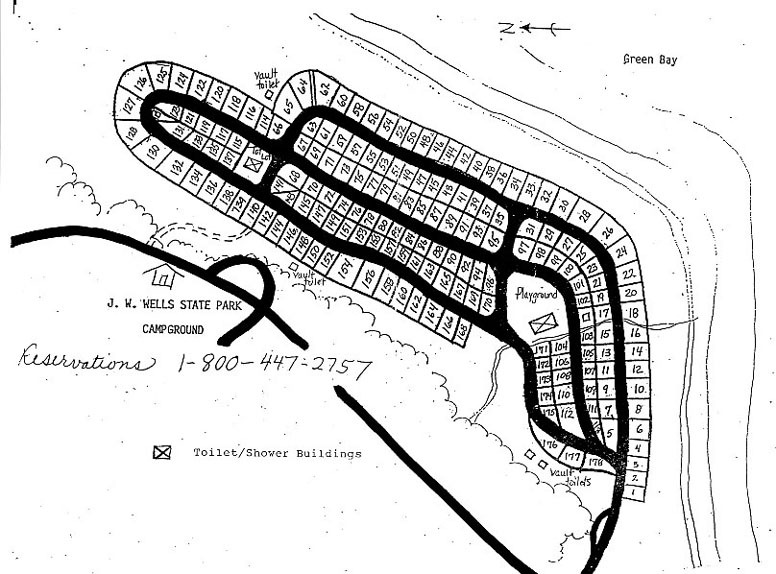 Most of the campgrounds let you pick your site because they were not filled up until the Labor Day weekend. Our roundtrip was about 1650 miles. We kept looking for an aurora borialis but unfortunatly didn't see one. We tried two types of smoked fish - Trout and Whitefish. The trout was more moist and oily the whitefish more dry and salty. Our preference was the trout fillets.